The Parfum Pur collection is cruelty-free and free of animal products, gluten, pesticides, fillers, phtalates and parabens. Made in small batches with essential oils, cold-pressed carrier oils, absolutes and resins that are ethically and sustainably sourced around the globe, you can rest assured that you are getting a quality product. My favourite perfume would have to be Vialed Hush, with notes of lavender, thyme, scotch pine, celery seed, juniper berry, neroli and sandalwood. No surprise there, since I've come to appreciate the benefits of lavender (more on that here) and sandalwood just happens to be one of my favourite scents. I especially love it because its aromapsychology profile includes stress relief, balance and calmness - just smelling it instantly relaxes me! Vialed Flower also contains lavender as well as pink grapefruit, niaouli, rosewood, tuberose, Bulgarian rose, patchouli and oud of assam. It has a beautiful amber tint and as you may have guessed is very fresh and floral. Psychological effects include feelings of celebration, fixation and hedonism. Vialed Momentum is made with cypress, lime, litsea, sweet basil, bergamot, blood orange, tangerine and ginger. It goes without saying that it has a very zesty and bright scent. I am a big fan of this blend, said to be awakening and instill concentration and courage. I wish I had this when I was back in university because this would have especially come in handy to perk me up during finals! Last but not least, Vialed Dream, a beautiful green mixture. Ingredients include frankincense, clary sage, wild verbena, yarrow, chamomile, ylang-ylang and juniper berry. It very much has a cooling, evergreen aspect to it, and can evoke curiosity, imagination and visualization. Despite not having mint, it has a very refreshing property to it, which I absolutely love! Each scent lasts roughly three hours when applied to my neck and other pulse points. It is recommended to shake the vials before applying since natural settling may occur. I will say I was a bit intimidated by the blends when I first smelled them because they are quite strong, however they become less pronounced when on the skin. Right after applying, I bring the perfume to my nose and take nice long breaths to inhale all of the goodness. 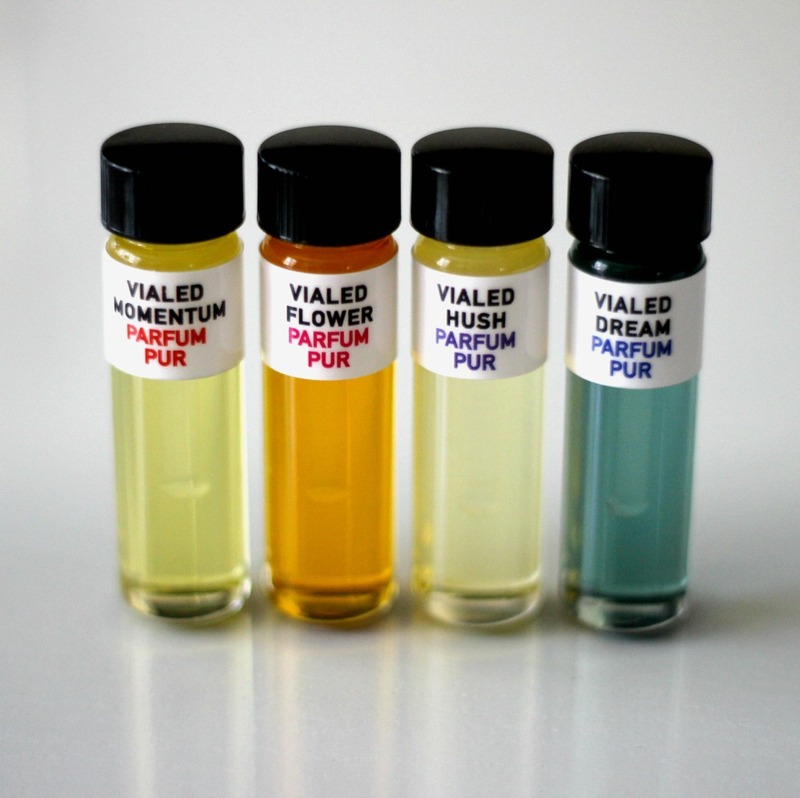 Call of the Vialed Perfumes come in glass vials (hence the name) and are available in two sizes: the smaller one (US $65.00, 7 mL or .23 fl. oz) includes a wand applicator, while the bigger version (US$80.00, 10 mL or .33 mL) comes with a roll-on applicator. And now for the giveaway! 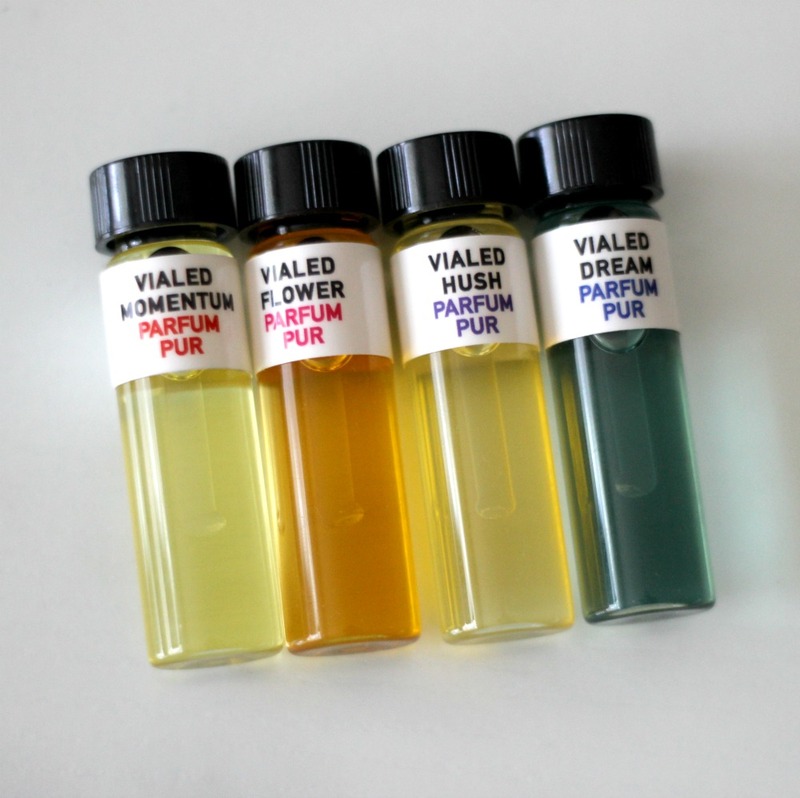 One lucky reader will win a Vialed Dream Perfume (10 mL, US$80.00 value). To enter, simply fill out the box below. The first few entries are mandatory - once completed, more entries will be unlocked to increase your chances of winning. This giveaway is open internationally. Good luck! The only perfume oil I've ever worn was Patachouli Oil (years ago!). Yes, I've used perfume oils for quite some time. I think my first time was with The Body Shop. Sandalwood was my first scent. I also have some perfume oils from Kiehls. Perfume oils are great because you only need to use a little bit and they wear very close to the skin. And a bottle lasts for a really long time. I love the notes of all 4 of these fragrances. I'd never heard of this company before. Thanks for introducing me to them. I'd love to win a bottle of Dream! I have never tried an oil perfume before. I've never tried a perfume oil before. I've tried, and enjoyed, Bobbi Brown's Beach. I like the idea of creating my own scent. I haven't heard of it before today! Yes, I have tried perfume oil before and I really liked it, I will definitely have to check this parfumerie out, because all four of the scents you tried sound great.